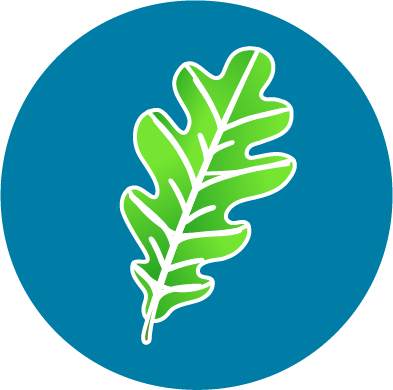 AlgaeCal Plus is a plant-based “superfood” calcium source naturally containing all 13 known essential bone supporting minerals (calcium, magnesium, boron, copper, manganese, silicon (silica), nickel, selenium, strontium, phosphorus, potassium, vanadium and zinc). The marine algae naturally digests these minerals right from the ocean, in amounts similar to your bone’s composition. Magnesium, vitamins D3, C and K2, and boron are all added to the organic, milled powder in proper amounts to complete the multi-nutrient complex needed to nourish your bones. Together, all these vitamins and minerals are clinically proven to maintain and improve bone mineral density. You may know calcium is the most plentiful mineral in your body. And 99% of all that calcium is found in your bones and teeth. But calcium does more than maintaining the very structure supporting your body. Calcium helps muscles and blood vessels contract, enzymes and hormones secrete, and messengers pass through the nervous system. It helps our blood clot when needed, our heart pump, and helps nutrients move through the body. Without calcium, your body would literally stop functioning! Naturally, we wanted to find an organic, plant-based calcium source that would not only provide all these benefits but would agree with our customers’ digestive systems. (Plus, not cause any side-effects like most traditional calcium supplements.) And that’s why we chose AlgaeCal. You probably know Vitamin D is an important ingredient for bone health. But like all the nutrients in this article, it’s responsible for a lot more than just strong bones. Vitamin D has many effects on the immune system, keeping you healthy and protected from autoimmunity (where your immune system attacks your body, unprovoked). What’s more, vitamin D promotes extra insulin secretion in times when insulin is required. Adequate vitamin D levels also may be responsible for decreasing high blood pressure. According to the National Institutes of Health, vitamin D may play a positive role in battling osteoporosis, cancer and Alzheimer’s disease. And of course, vitamin D is critical in calcium absorption and maintenance in the body. Calcium and vitamin D have proven that together they can drastically improve the absorption of critical nutrients in the bones. You’ve probably known that for years. But what you may not know is vitamin D and calcium pair up to do other helpful things in our body. In fact, several recent studies prove vitamin D and calcium are connected with weight loss. The thinking is menopausal and postmenopausal women may be able to reduce weight gain because the two nutrients affect how the body breaks down and stores fat. What’s more, two major studies in recent years show convincing evidence that increased calcium and vitamin D levels can reduce the risk of cancer. While these nutrients alone aren’t enough to ward off the disease, they can be helpful in treatment. Read more about these two studies that discuss calcium and vitamin D’s connection with cancer. Boron is actually a naturally-occurring carbohydrate in many fruits and vegetables. Often referred to as the “boron vitamin”, this trace element is proven to promote healthy bones and joints. More recently, boron is thought to promote Vitamin D metabolism, improve prostate health and regulate steroid hormone levels. 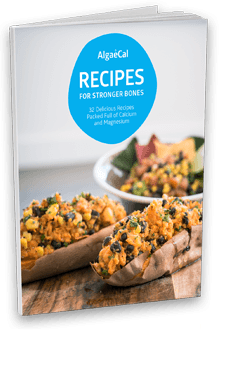 Specifically relating to the bone, boron helps retain healthy calcium and magnesium levels. And that’s an important reason why boron helps maintain bone mineral density. Magnesium is another “partner nutrient” of calcium. The two complement one another, as too little magnesium can interrupt calcium metabolism. Magnesium is also key in managing the hormones that regulate calcium. In this way, magnesium deficiency may be a risk factor for developing osteoporosis. But- like all the vitamins and minerals on this list- magnesium’s effects are more than bone-deep. In fact, did you know magnesium is responsible for over 300 biochemical reactions in your body? It’s true. As a quick list, magnesium helps muscle and nerve function … blood pressure and sugar levels … energy metabolism … steady heart rhythm … bone density, and many other things. 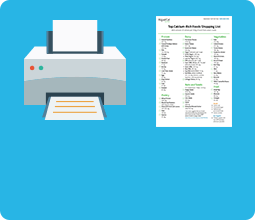 Vitamin K2 (the MK-7 form) is the world’s most expensive vitamin. At $218,000/lb, it’s easy to see why. But AlgaeCal Plus has a full daily dose of vitamin K2-7. What’s so special about this vitamin? Well, think of vitamin K2-7 like a “recycling plant” for the calcium coming into your body. When calcium is deposited in the body, vitamin K2-7 comes along and transports it in proper amounts, to the proper areas. For instance, K2-7 directs calcium into the bones where it’s needed, and away from soft tissues it’s prone to collect, like your arteries and kidneys. In this way, it’s also a positive ingredient for improved cardiovascular health too. Vitamin C is an important antioxidant with several crucial roles in our body. And since it’s found in AlgaeCal Plus, it’s naturally proven to influence bone health. Specifically, vitamin C helps trabecular bone growth (the spongy, interior part) by promoting bone expression genes in our bone-building cells. In fact, recent studies show a vital link between vitamin C and bone genetics, with vitamin C playing a positive role in bone development. When you add protein synthesis to this list, you’ll see just how important vitamin C is not only to your bones but to everyday function! You know about calcium. You know about magnesium. And now you know about boron too. But did you know there are another 10 minerals your bones must absorb to stay dense and strong? That’s 13 minerals in total making up your bone mineralization. And while there are minuscule amounts of the other 10 minerals in your bone (called trace minerals), that doesn’t mean they aren’t important. In fact, lacking any number of these can lead to lowered bone density. And when your bones lose an average of 1% mineral density each year after age 40, they take the 13 minerals with them. So, short of purchasing all 13 minerals to maintain and improve bone density, what can you do to get enough of them? Well, you could try putting together the perfect meal plan that might just give you enough. Or, you can take AlgaeCal Plus. Remember, this plant-based, whole food calcium naturally contains all 13 minerals in proper proportions (plus, added vitamin K2, D3, C, and boron). 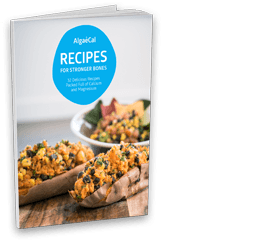 In fact, the marine algae in AlgaeCal Plus pre-digests these minerals in very similar amounts as those in your bones. That’s why AlgaeCal recommends a multi-nutrient approach to bone-building. Any one-, two-, or even 12-ingredient combination won’t provide you the proper nutrition for your bones. Strontium is another natural, earth element found in trace amounts in your bones. But strontium has a bone-health “claim to fame” that other minerals don’t. You see, strontium is the only known mineral to have a dual effect on bone. While strontium can increase the amount of healthy new bone you build, at the same time it naturally slows down bone loss! Taking the proper amounts of natural strontium is like turning back the clock on bone density loss. But notice I said “natural” strontium. That’s because there are man-made forms of strontium that aren’t effective in this way– and cause a host of nasty side effects. 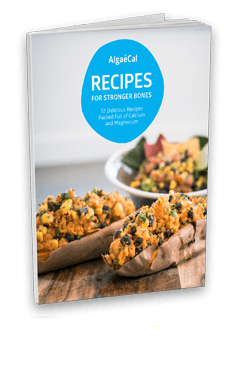 Read all about strontium, its various forms, and the natural form’s positive effect on bone health in our comprehensive strontium guide. But for now, just know that natural strontium citrate- taken together with AlgaeCal Plus- is the reason we can guarantee increased bone density in 180 days. That’s thanks to Strontium’s dual effect in natural bone remodeling. Now, AlgaeCal Plus already contains trace amounts of natural strontium. And that’s good for your bones. But it takes higher doses of strontium to really kick-start bone growth. That’s where Strontium Boost comes in. When combined with AlgaeCal Plus, the natural strontium inside Strontium Boost makes the whole food calcium work better, and faster. For more information on strontium, you can visit the link below, or go here for the full story on Strontium Boost. There you have it. You’ve just seen the full ingredients list behind the only calcium supplement that can increase bone density, no matter your age. Thanks to the 13 naturally-occurring minerals in our protected ocean algae- and the added vitamins- your bones absolutely can return to youthful density. With AlgaeCal plant calcium, there are no secret ingredients or unsubstantiated claims– just natural goodness with proven results. After all, nature knows best. 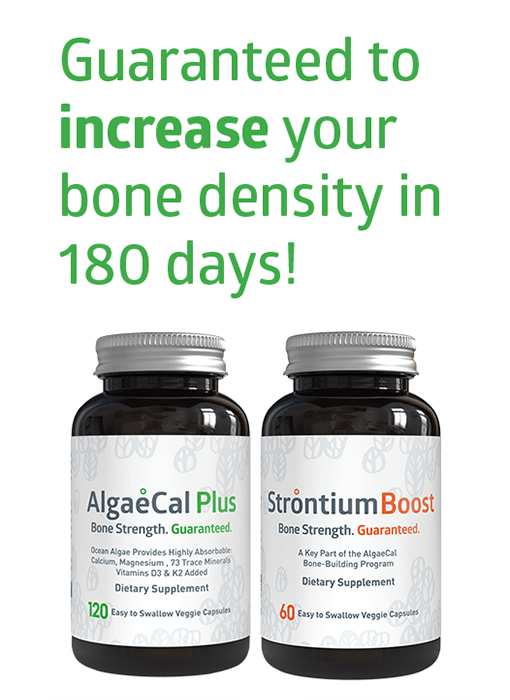 For more information on AlgaeCal Plus and Strontium Boost, you can read about this bone-building duo here.